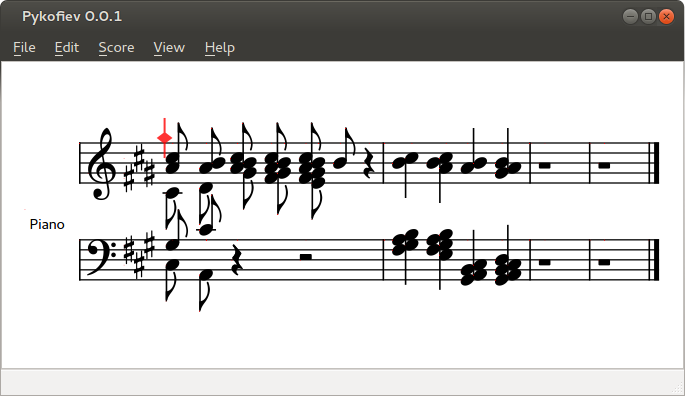 In January 2014 I started a formidable project: I am writing sheet music editing software. I feel I am very qualified to do so because I am a musician, a composer who knows a lot about music notation, a good software developer, I always put myself in the user’s shoes and I have been using music software for 24 years, having accumulated a little list of wishes that have never been granted by Finale, Encore, Overture, Sibelius, Notion etc. In fact, the project grew out of my dissatisfaction with all these existing programs. As a composer, I feel using their software is frequently uncomfortable. Even Sibelius, the most user-friendly of them all. Maybe the result of my efforts will be a little more comfortable to use. Finale is powerful but unfriendly, it couldn’t be used for composition. Encore had the best GUI during the 90s but today it is seriously outdated; its (re)positioning bugs have never been fixed and the user interface is still based on toolbars. Overture, which was once the successor of Encore (same author), hasn’t seen a release in years. Sibelius is powerful and user-friendly but in July 2012 Avid fired the original development team, so it might be dying too. Notion is the new kid on the block, it has the best playback features but also the worst notation abilities, you can’t change the keyboard shortcuts and anything you do requires a mouse click. All these programs were written in C++. I am creating mine in the Python language, such that the result will be hackable by its users. They will be more able to scratch their itches. But the problem is that the scope of the project is so daunting. I have a huge backlog of features I need to implement before my solution can compete. I estimate the entire project will take 2 man-years before it can be useful to anyone. It is July already and I have been able to work on this project for only 2 man-months, so there are 22 to go. When I think about this, I feel I am a little crazy for even having started it. If I give up, I will have wasted X months of my life and nobody will ever have had any use for any of it. After 2 man-months of work, what do I have? My program reads scores created in other programs in the MusicXML interchange format and puts the score in memory. (Representing music in the computer memory poses intimidating problems by itself.) It also shows a subset of the music symbols on the screen. You can zoom in and out, you can cycle through a few color themes and you can change the title of the piece. Undo and redo have been implemented and there’s a neat framework that will be used for every user command. Many keyboard shortcuts have been planned and placed in a configuration file so the user can change any of them if she wishes to. A music cursor already exists that travels through all notes in the piece. But you still cannot add, change or delete a single note. And there is so much still not shown on the screen... There are no beams, no slurs, no articulations, no dynamic markings etc. This is because music notation is very complex. Simply displaying it on screen is very hard. If you are a musician, can you articulate the rules to display clusters of notes? Questions of spacing have to be faced... In my software, from day zero, the collisions (between music signs) that plagued this kind of software for years and years, making users drag symbols all the time... these placement problems are considered bugs with the greatest priority. Nobody wants to be fixing these manually, the program must get this right without any human help! If this project is so hard even today, I can imagine what the Finale developers accomplished back in 1988 ― such software did not yet exist. Respect goes out to them, deep respect. Today I have open music fonts that I can use, the Python language and the Qt framework which do so much of the work for me, especially concerning graphics. Even creating PDF files probably won’t be much different than showing the stuff on the screen, thanks to Qt. Help making the project financially viable. I haven’t found an investor. Here in Brazil, crowdfunding websites such as catarse.me exist but are less successful than in, say, the U. S. Kickstarter itself is not available here. Also, I am a very technical person, I don’t like my business abilities. Help programming. The software is being written in the high-level Python 3.4 language, which is proving to be a very good choice because it is so expressive and easy to read. Performance is fine so far even without any optimization. For the GUI I am using Qt through Pyside. Playback features are deferred to the end of the backlog, but it wouldn’t hurt to have someone get started on them. I have ideas (to do things differently from the competition) in many subjects, including playback. When the time comes, help testing the application will be very appreciated. I have dreamed of writing this software for decades. In my dreams it would always be open source. But right now I don’t see how open source could ever repay such an effort. I need to be adequately compensated for this work. This will probably be cheap software, but not (immediately) open source ― even though I like free software so much. Can you help? Any messages about the project are very welcome! Here is my opinion on Python web frameworks. It is full-featured, with a very well-defined scope as a web framework and a really careful implementation of all the right choices, organized by this little genius called Chris McDonough over literally years of dedicated development. Routes are decoupled from request handlers, while offering both URL dispatch and tree traversal. You can use whatever templating languages you want, including Genshi, Kajiki, Chameleon, Mako, Jinja2 etc. You can use whatever you want as a database, including SQLAlchemy, the most powerful Python ORM. It has a great authentication and authorization framework which is independent of your choices for data persistence. It makes your project an independent Python package, teaching you to use standard Python packaging tools for your benefit. It has the best scheme for reusing existing projects, since you can overload templates and views as you integrate another Pyramid site into yours. For an example, see horus, a Pyramid pluggable authentication app using SQLAlchemy. It avoids the global variables and threadlocal variables that other web frameworks, such as Flask, like to use, thinking they will be convenient, until they make some things impossible. It is thoroughly documented and has a great community with a great IRC channel and a great mailing list. Pyramid takes time to learn properly. You have to read the documentation and practise for a while. It is old and well-established. It has by far the largest community of all web frameworks in Python. Very quick to get started because everything has been chosen for you, including templating language and an ORM (even if you don’t want or need an ORM). Therefore, there are many existing reusable applications developed in it. These apps tend to work well together because they use the same stack. It is old and needs to maintain backwards compatibility, so it evolves slowly. Its daft templating language is severely and deliberately handicapped. It goes to great lengths to prevent you, the developer, from putting logic in a template ― it even forbids you from calling a Python function from the template. Then, in order to remedy this, it allows you to implement a filter, which is nothing more than a way to call a function. What could be more retarded? The syntax of this templating language is also too verbose. On the plus side, many people use Jinja2 instead, which has the same bad syntax, but lets you call functions and works very well. People are impressed by the admin, but it really isn’t important at all for development. Other frameworks, being less tightly integrated, cannot offer an admin that would work for everybody. Again, this is of no consequence for real world development. Its ORM, created before SQLAlchemy existed, is now much inferior to SQLAlchemy. It is less flexible, its API is less well thought out, and it is based on the Active Record pattern which is worse than the Unit of Work pattern adopted by SQLAlchemy. This means, in Django, models can “save” themselves and transactions are off by default, they are an afterthought. In SQLAlchemy, one thinks in transactional terms from the start. This talk explains this better. Model relationships have ON DELETE CASCADE by default, which is a poor choice because it is not safe ― one might lose data because of this. The default should be safe, and the programmer would declare the cascade when applicable. To avoid cascading, one needs to write on_delete=models.PROTECT in each ForeignKey. Models can have no mixins ― only simple inheritance. Less powerful than SQLAlchemy. Many projects don’t access a database, but there is no way to turn off the ORM, you even have to configure it. Django enthusiasts sometimes boast that Django is a single package. Don’t they realize this is actually a bad thing? Django is a tangled monolithic piece of software. The fewer dependencies you have, the more code you have to write yourself. Django is in fact a bad case of Not Invented Here syndrome. Django by itself does not encourage anyone to learn and use standard Python packaging tools. Class-based views, again, for a different reason. If you ever want to subclass one of them, to change their behaviour slightly, you will be in pain. This is because they themselves are a deep hierarchy of subclasses. Too deep. So you read about 10 classes trying to figure out where you should interfere. This is such a big problem for every Django user who likes class-based views, that an entire website was created to help understand them: http://ccbv.co.uk ― the very existence of which should be seen as a red flag. Gets you started quickly, if the job is simple. Suffers from thread local variables everywhere. Severely incomplete documentation that seems to only explain something to someone who already knows it. Plugin greed: Flask enthusiasts may want everything in the system to be a Flask plugin, which is just plain bad software architecture. What advantages do I see in Google App Engine? The documentation is laughable. Very unhelpful. Google folks don’t seem to value an appengine-enabled Python interpreter for the developer to try things out. In order to obtain an ipython shell you have to resort to a tremendous hack that includes adding several directories to sys.path. Often, interesting subprojects appear, then their bugs are never ironed out and the projects are discontinued by Google because nobody uses them. Lock-in. Develop for the Google App Engine and you can only deploy there. What advantages do I see in web2py? web2py does not offer an ORM (object-relational mapper), only a DAL (data access layer). It boasts this as a great advantage (it’s not a bug, it’s a feature?). By the way, SQLAlchemy has 2 layers: its ORM is based on its DAL, and you can use the one you prefer. I didn’t familiarize myself with web2py after seeing this, but I don’t suppose I am missing much. ― Acho que hoje ele não vem. Já está tarde ― disse vovô, esperançoso. Olhei para trás: os olhinhos castanhos de meu priminho Vit ostentavam sua diversão. Como gostávamos de brincar de espião! Fiz sinal de silêncio com a maior veemência. ― Ele sempre vem no início do mês. Pode tardar, mas não tem misericórdia ― soluçou vovó. ― Arre, mulher! É por isso que nada de bom acontece nesta casa! ― bufou vovô roucamente. Estiquei a cabeça para além da quina do armário. Suas feições graves não me encontraram. Titia surgiu do quintal limpando as mãos. Escondi-me de novo. ― Mas ela tem razão ― contemporizou. ― Ficando aqui, estamos sujeitos a essa desgraça! ― O que não tem remédio... ― grunhiu vovô, aproximando-se. ― Isso não tem remédio! Disparamos na direção da entrada da casa com estardalhaço. Vit continuou brincando como se não tivesse escutado nada. Eu era maior e não sei se entendia mais, mas a conversa me deixara um pouco preocupado. ― Crianças, não saiam! ― gritou vovó, lá da cozinha. Esgueirando-nos pelos cantos, chegamos à janela da frente. Olhamos para fora com cuidado para não sermos detectados, pois restava uma pitada de crepúsculo. Ventava muito: a árvore do outro lado da rua parecia tentar desprender-se do chão. Meus pensamentos foram interrompidos por um estalo medonho, seguido de um trovão, que arregalou os olhinhos do meu primo de susto ― e eu mesmo tive um arrepio, que o raio deve ter caído bem ao lado da casa. Em seguida desabou uma chuva de granizo, a qual assistimos da janela. Um carro ― lembro que era grande e escuro ― parou em frente à nossa casa. Um minuto depois, desceu uma enorme figura oculta numa capa de chuva bege. Enquanto fechava a porta, pensei ter avistado... o quê? Pelo? Vit riu baixinho e me puxou para baixo. Empurrei-o ― tinha que olhar ― algo não estava certo. O vulto dirigiu-se à casa da frente. Segundos depois, abriram e ele entrou. ― É um mon ― começou Vit, mas tapei sua boca, pois nesse momento pude discernir gritos vindo da casa da frente, mesmo sob a chuva. O alarido durou alguns segundos, o que era? Consternação? Pavor? Meu mal-estar só aumentava. A chuva agora estava mais fraca. A porta se abriu e o vulto veio direto para a nossa casa. A cada passo, um pesado estalido. Vit apertou meu braço com aflição. Arrependi-me de fitá-lo, pois ele detectou o medo nos meus olhos. A campainha soou dura: de um pulo, puxei meu primo para trás da cortina, de onde assistimos o resto da hedionda cena. ― O aluguel atrasado, senhores. If you are into classical music, you know how hard it is to organize your audio files. The most important problem is lack of support for the “Composer” tag in music player software. For a while, this led me to the idea of reusing the mainstream “artist” tag to contain composer information. But then performer information must go into other tags such as “Album” or “Comment”. The advantage of this approach is that it works with any and all music players. But it has many disadvantages. First of all, tagging your music becomes an endless nightmare: no tagging software I have encountered out there does it this way, so basically you would have to make corrections manually. Forever. Remember that your are files always coming from many different sources, so you would have to keep track of which files have already been converted to your system. What about my phone? I’ve been unable to find an Android music player with support for the “composer” field. I did find hints on the web and tried a few players, but the tips were written years ago and apparently the newer versions do not support the “composer” tag anymore. Since phones are unable to carry that much music anyway, I intend to just use any directory-based player. What’s important is that my collection will be correct and give me less of a headache. Use the “composer” field: use the correct tags and spend some time to find software that supports them. Such software deserves to be preferred. Regardless of tagging, keep your collection well organized in terms of directories. This is a traditional movie in many ways. But which traditions? Well, you are going to see a (non-satirical) picaresque fictional story about a horse in First World War times, derived from a book for children. So the foremost tradition is that of the horse movie. You get everything you would expect: themes of friendship between a youngen and a special horse who is one of the most important characters, stunning visuals that only nature and animals can provide, gallops, adventure etc. Because the horse is perhaps the main character, he is going to suffer. Be prepared for this. However, it’s all in good taste. Now remember the story has something of a picaresque quality, without really belonging to this genre. To me this means the hero goes through adventures in different places during his life, and whether characters reappear later is anyone’s guess. These episodes may sometimes seem a bit disconnected from each other, however this is part of the wonder, you would exclaim: “what an interesting life”! And I have to say, this falls quite nicely upon a traditional horse movie character who would like his freedom. So if the plot is sometimes stretched, well, in my opinion this is just part of the genre. There is no satire though. The First World War is the circumstance that keeps these episodes together. But this is only a war movie to the extent of old, traditional war movies. I mean, this isn’t a remake of Private Ryan, gore isn’t the focus. This isn’t an ultra-realistic movie in any way and Spielberg has been able to mix these 2 genres (war and horse) in a tasteful way. I guess I mean to say, there is war in the movie, but it isn’t exactly a war movie, it isn’t focused in showing the raw horrors of war, and if it were, you might care that much less about the horse. You gotta like the horse, otherwise the movie won’t make sense! And I understand this is true, that horses did indeed suffer in that war. The fact that the Germans speak English put some people off; they wanted to see subtitles. I guess they were expecting a contemporary war movie. But remember that children are to be included in this audience... I, for one, felt it refreshing to see raw realism – which would be pointless here anyway – give way to a more direct way to tell the story. This looks back to old war movies, in which foreign characters might speak their own languages a bit for effect, but not when you really had to understand what they were saying. In many ways, that was a better way to just tell a story. Some people complain that the first part was slow. Another complaint is that there wasn’t enough friendship established between the horse and the boy. I thought the balance was perfect between these two opposing forces. Finally, you get traditional John Williams music, not so memorable but perfectly adequate. And Spielberg is the perfect director to manipulate your heart, which makes many people mad at him. How dare he?! Now you are prepared to be entertained by a pretty good film, knowing that it won’t change your life. When people buy a new computer, it tends to come with Windows preinstalled. Because of this, most people just use it – unaware that it would be much better for them to install Linux instead. Further, Linux is free. And they want your money. Antivirus software is always intruding, showing to you that it is working for you, this way you will always remember it is useful, and you are more likely to pay for protection every year. What is this like on Linux? No worries, no antivirus software is needed. 2. Windows is simply slower. Because of the antivirus software constantly running in the background, there is no way a Windows system can compete with secure systems in terms of performance. The user is constantly being bothered by one or another program (Windows itself, Java, antivirus software, web browsers etc. etc.) which wants to be updated. This could easily be so different! What is this like on Linux? There is a single packaging system to install and update software programs. This means when you are informed of available updates, the information is comprehensive of all the software you have. On Linux you get interrupted much less. Further, the software that comes with a Linux distribution is much more comprehensive than that which comes with Windows. For instance, on Linux it is very easy to get all the multimedia codecs installed, while on Windows there are many options for this, all of which feel unsafe. 4. Windows hardly respects our right to turn off the computer. Windows thinks disconnection time is appropriate for installing software updates. (The process continues when the computer starts up again.) There is a way to turn off the computer without installing anything, but if you click on the OTHER way, then you can’t cancel it. This is absurd. Further, it takes forever – sometimes a whole hour – to install updates. No control over this is offered to the user. What is this like on Linux? You are notified of new available updates. You choose when to download and install them. Most updates are applied quickly and take effect immediately. Only a few updates require a boot to take effect, and you are never really required to boot right now. 5. The desktop is extremely polluted in practice. one for “HP Quick Launch”. The last two are certainly pointless and I would have them disabled. Actually as I wrote this, avast antivirus created a second icon (as if one weren’t enough to show off its work) and Windows created yet another to say it is downloading more updates... Total icons: 10. Further, many applications we install under Windows like to add their own toolbars (unrelated to the reason you’re installing the app for) to web browsers, stealing screen space, confusing the user, who most likely never uses the toolbar... Applications add their own icons to the Start menu, to the desktop and to the Quick Launch buttons. The Start menu has its own selection of the most used apps. What a mess! What is this like on Linux? Since applications are mostly free software – not proprietary –, and because the most important applications are part of the operating system as packaged by an organization, there is no conflict of interest leading to desktop pollution. In practice, the desktop feels simpler and better organized. 6. Too many difficult questions are asked. Too many applications, and even Windows itself, are constantly demanding the user’s attention, as if saying “I need maintenance”... Countless misfeatures work this way; for instance, Windows offers to clean the desktop for you, hiding icons because you rarely use them. Of course this kind of thing steals your attention from the work you are actually doing, they are annoyances. The simple fact is user’s aren’t bothered quite so much in other operating systems, these just don’t need any maintenance. What is this like on Linux? No weird questions pop up, you just work without being interrupted, save from the software update question, which can have its periodicity configured (daily or weekly). Linux should not be installed by people who don’t know what they are doing – but once installed, using it is a breeze. For my grandmother, I installed Ubuntu Linux. 7. Did you initiate this action? The effect of this is that the user experience under Windows, as of 2012, is one of clicking much more to do the same configurations, than any of the other operating systems. I wonder, how do these manage to be much more secure, yet bother the user much less? What is this like on Linux? This problem does not exist, it is just the result of Microsoft incompetence on Windows. Unless you really need to use software that is only available on the Windows platform – i.e. AutoCAD –, it makes no sense to pay for it. Linux comes with much more functionality and costs nothing. Microsoft does not deserve that you honor it with your preference, since it is known for immoral and illegal actions in the computer market, both against competitors and against consumers. I shall mention only one immoral practice against consumers which should be enough to convince you: the Starter Edition – a severely crippled operating system that prevents the user from opening more than 3 applications simultaneously, or storing more than 120 GB on their hard drive, or using more than 512 MB RAM... This is pure evil because in Brazil computers with this system preinstalled have been sold to unsuspecting customers, who then had to replace it. After winning the browser wars, effectively driving Netscape Navigator out of the market, Microsoft didn’t work on its browser, Internet Explorer, for years and years, ignoring the cries of web developers against its hundreds of bugs. Microsoft only started improving this situation after a better browser, Mozilla Firefox, finally appeared to endanger IE. Now Chrome is the most popular browser but IE still holds the web back to an extent, since it is still popular but lagging behind the other browsers in support for the newest web standards. When you use Internet Explorer you help drive the statistics to its favour, which influences decisions that hold back the web. So don’t use it. This is a product that does not deserve your preference. If you are at all interested in computing or invention or creativity, you shall now watch this talk by Bret Victor. Today I am starting a new blog ― and I am also excited because I can finally get rid of the old thing, using something much simpler: Tinkerer, a static blog generator written in Python. There is a powerful text markup language that Python developers have traditionally used for documentation. It is called reStructuredText. Nowadays, with everybody using Sphinx, reStructuredText is even more popular. So Python developers needed a blog system that supported reStructuredText. Blogging is easier without mental context switching between markup languages. So when famous programmer Ben Bangert mentioned Tinkerer in a chat, I immediately knew it would be eagerly adopted by Python developers. Ben has just migrated from Tumblr to Tinkerer. For common people who want a new blog, I still recommend Tumblr though.